Good Sunday morning from Göteborg! Pronounced Zhyuhr-te-bor-ghee (or something like that, as told to us by our instructor for today, Karin Nelson). We were fortunate to sleep in and leave at 12:30 pm; a much appreciated late start to the day for the slow risers in the group. Prof. Karin Nelson, Göteborg University. We took a leisurely stroll for a half hour to the Göteborg University School of Music and Drama. There we met the aforementioned Karin Nelson, Professor of Organ. 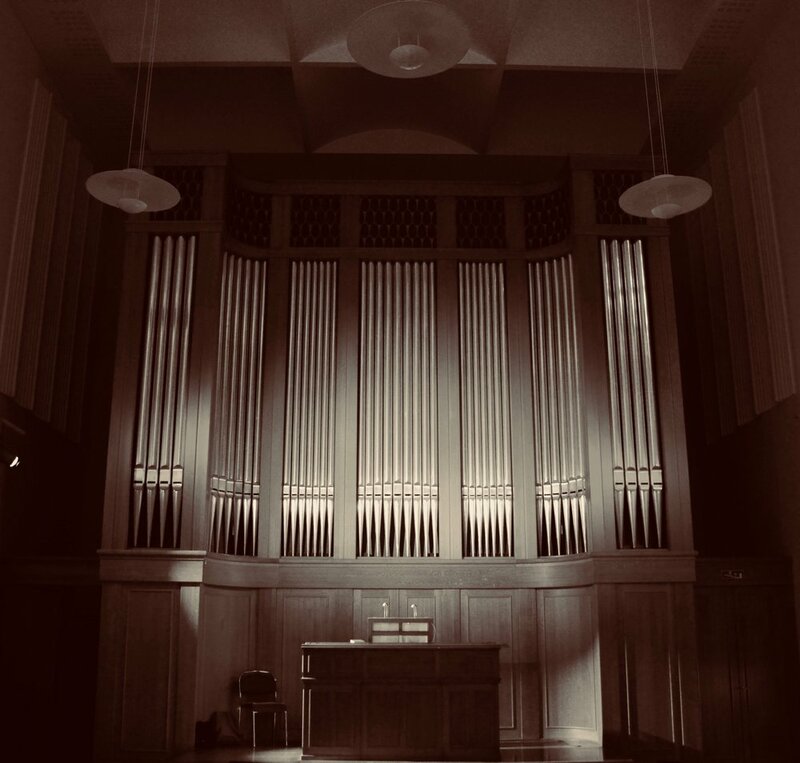 She brought us into the organ department recital hall, in which there are three organs: a large 3-manual French romantic Cavaillé-Coll style instrument, an English organ from the 1800s, and a German organ from around 1650. After a short talk about the music played on the one manual German instrument, such as Scheidemann and Sweelinck, and these composers' improvisational styles, we took turns improvising over different harmony patterns. For some, venturing into the unknown territory of improvisation was outside their comfort zone. But, as we affirmed today, it is an essential skill when playing the organ. After our improvisation exercises, Jen, Cho, and Chris P. each treated us to repertoire selections by Sweelinck, while Corey went with Buxtehude and Clementi, trying out some keyboard music on the instrument. This, and the English instrument, can be pumped by hand, and Corey acted as the designated organ pumper for the day. See photos for evidence of his skill! Corey De Tar pumps the 17th-c organ in Göteborg University. The German instrument contained a modest number of stops: something along the lines of 8’, 4’, 4’, 3’, 2’, 1, and a reed: the short-resonator Regal stop. The Regal is a very characteristic sound of early instruments, somewhat resembling the modern kazoo. The flutes were light and airy and the principals narrow-scaled, creating bright and buoyant sounds often associated with the virtuosic keyboard figuration found in early keyboard works of Froberger, Muffat, Sweelinck, Frescobaldi, Scheidt, and the like. The English organ presented us with different timbres with which to play; most of these sounds contained more fundamental tone and were warmer. Behind us loomed the much, much larger romantic instrument built in 1998 by Verschueren. 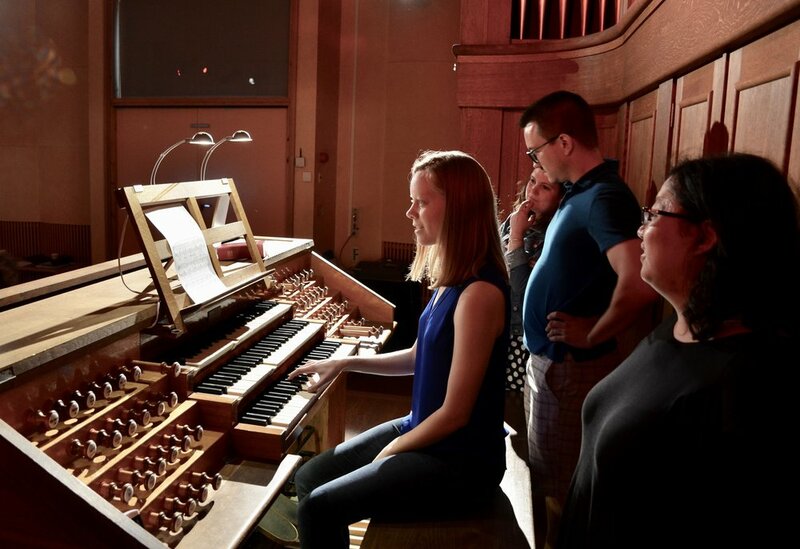 Modeled after Cavaillé-Coll, the leading French organ builder of his time, it provides the university's students access to a representative organ for French romantic organ repertoire. Initially, when we had arrived, Karin informed us that the organ was having electricity issues and wouldn't stay powered on. However, with a little gentle nudging from yours truly, we gave it another go and were able to get power. The 1998 French romantic organ in Göteborg University. The stops are laid out much as they would be on a real Cavaillé-Coll: the pedalboard and distance between the keyboards are similar, and the foot levers that control both air supply to various parts of the instrument and coupling between keyboards were also of Cavaillé-Coll’s standard layout. The reeds were full of fire, unlike we’ve heard yet on this trip: the principals were warm and wide scaled, and the strings possessed qualities that cut through the fundamental tone to add a solid core to the sound. Prof. Karin Nelson demonstrates the 1998 Verschueren organ. Before we got around to trying the instrument ourselves, Prof. Nelson showed us a couple fun ways of using ostinato (repetitious rhythms/harmonies) to accompany hymns. For instance, we paired a Gymnopedie by Erik Satie with the hymn ‘Holy, Holy, Holy’ (of course we sang in Swedish), and a standard jazz chord progression was applied to a popular Swedish hymn called Der blomsterstid nu kommer. I then managed to fit in a quick run through of the finale from Vierne’s Sixth Symphony, while Chris P. offered Franck’s Choral No. 3, Jen let us hear the first movement of Widor’s Fifth Symphony, and Karin introduced us to the music of Swedish composers: Emil Sjögren, Harald Fryklöf, and Elfrida Andrée, among others. Having spent four hours with our gracious host, we ended the day with some tips for shorter organists (as Prof. Nelson is even shorter than Jennifer, who often has trouble reaching the pedals). After our afternoon appointment, we strolled back to the house, where we lounged for the rest of the day. Chris L. and I went to the grocery store for the evening’s meal, for which I made cajun chicken fajitas with strawberries and fresh whipped cream for dessert. Light conversation around the dinner table brought this easy-going day to a pleasant close. 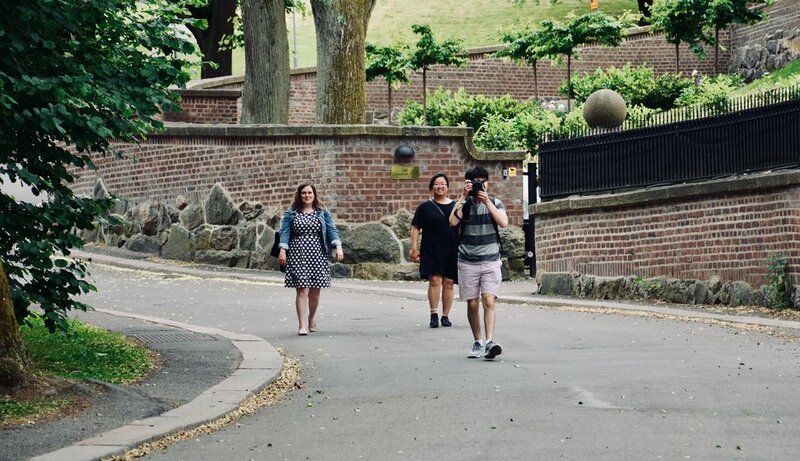 Chelsea Keating, Jennifer Hsiao, and Brandon Santini approach Artisten in Göteborg. The pond outside of “Artisten,” Göteborg University’s center for the arts. Prof. of Organ Karin Nelson, Göteborg University. 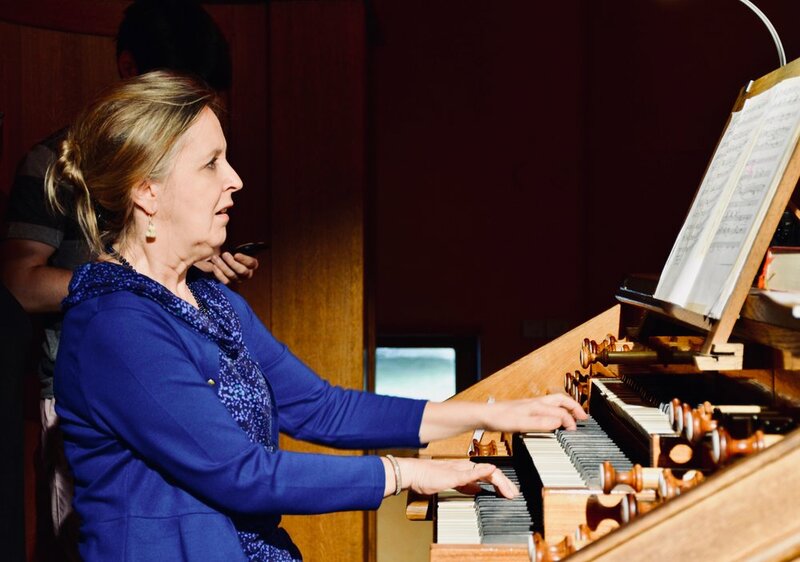 Prof. Karin Nelson demonstrates the 17th-century Manderscheidt organ at Göteborg University. 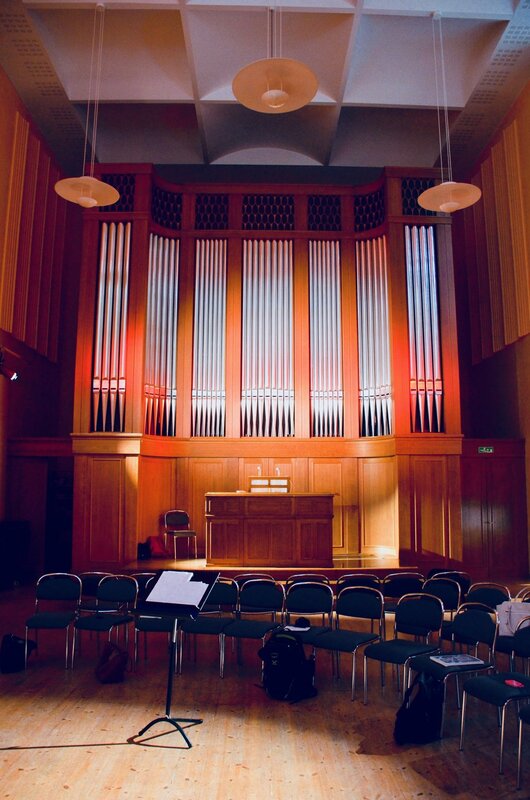 Laura Gullett plays the Manderscheidt organ in Göteborg University. Corey De Tar pumps the bellows of the 17th-c organ in Göteborg University. 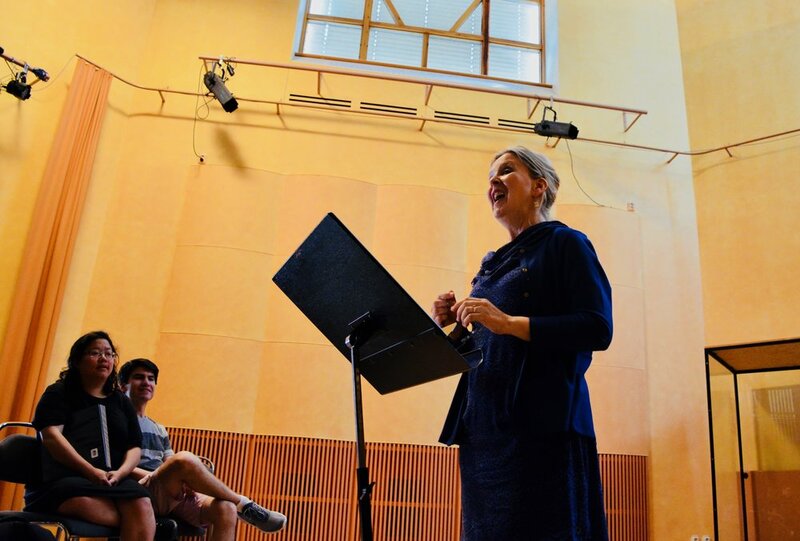 Prof. Karin Nelson lectures to members of Boston Organ Studio. Corey De Tar and members of Boston Organ Studio in the organ and choir hall of Artisten. 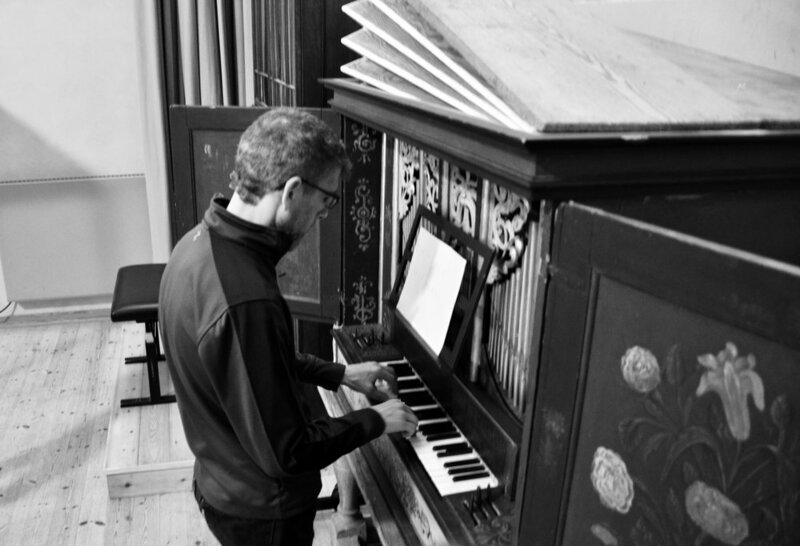 Chris Porter plays the 17th-century Manderscheidt organ at Göteborg University. Corey De Tar pumps the 17th-c Manderscheidt organ for Prof. Karin Nelson in Göteborg University. Adrian Cho plays the 17th-century Manderscheidt organ at Göteborg University, while air-pumper Corey De Tar looks on. Detail of the 17th-century Manderscheidt organ at Göteborg University. Prof. Karin Nelson lectures to members of Boston Organ Studio at Göteborg University. The 1998 Verschueren organ in Göteborg University. The 1998 Verschueren organ in Goteborg University. Prof. Karin Nelson demonstrates the 1998 Verschueren organ in Göteborg University. Console detail, 1998 Verschueren organ in Göteborg University. 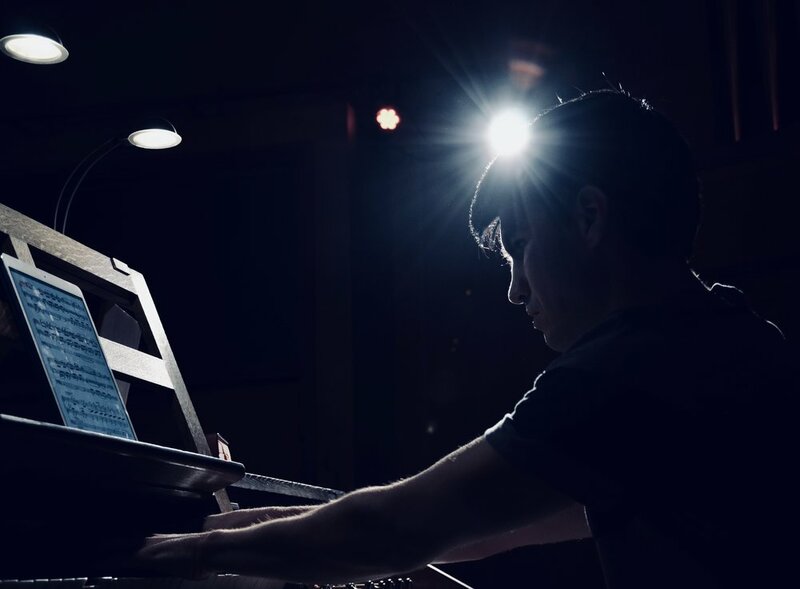 Brandon Santini plays the 1998 Verschueren organ in Göteborg University. Laura Gullett plays the 1998 Verschueren organ in Göteborg University. 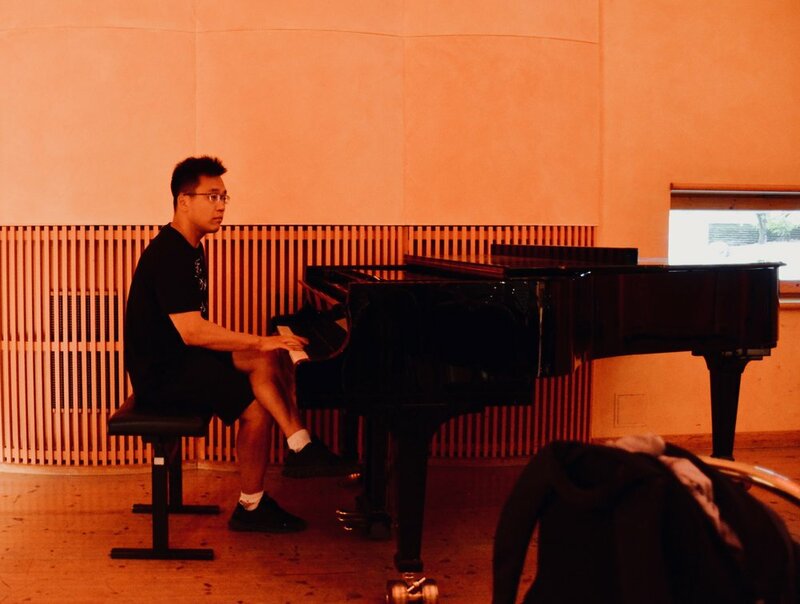 Adrian Cho plays the Steinway piano in Artisten, as part of improvisations with organ and choir (members of Boston Organ Studio). Prof. Karin Nelson sings with members of Boston Organ Studio, while a painting of Elfrida Andrée — Swedish composer & past organist of the Cathedral in Göteborg (the first female cathedral organist in the world) — is in the foreground. Christian Lane observes a performance in Artisten, Göteborg University. Chris Porter plays the 1998 Verschueren organ in Göteborg University while Brandon Santini looks on.